Online Booking – Once in a month Arjitha Archana Seva tickets will be released for online booking. Devotees are allowed to book 2 tickets. Lucky Dip Booking – Devotee has to enroll at Vijaya Bank Counter, CRO Office Tirumala for the lottery system. Results of the lucky dip process will be known in the evening hours. Following which, the devotee should collect the ticket from MBC 34 counter by paying the ticket cost. Children under 3 years will not be allowed for this Seva. Children under 12 years don’t need Seva tickets, it is free entry for them. Please carry Kid’s age proof photo ID. During the Sahasranamarchana Seva, the recital of the Lord’s name is done, and general blessings are involved in the names and the gotras of the ticket holders. 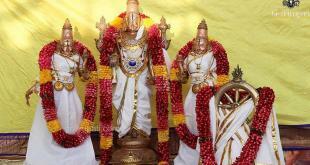 This Arjitha Seva will be performed on all days except Friday’s. 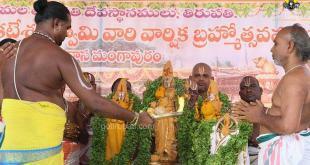 Temple priests will chant the 1000 names of the Lord. Main deity will be worshipped with Tulasi Leaves. Later the Tulasi leaves which are collected from the Lord’s Holy feet will be placed at the feet of Sri Maha Lakshmi. Temple priests chant Mahalakshmi Chaturvimsati, the 24 names of the Goddess. Well before beginning the Seva, devotees are allowed to sit inside the Sanctum Sanctorum. 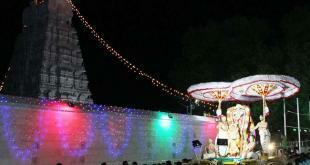 On Mon, Fri, Sat and Sun this Seva will be performed in Ekantham. Which means only temple priests perform this Seva with no devotees presence.